Roger and Kathy invite you to stay at the Seascape Guest House for bed and breakfast on Weymouth Seafront. Our terraced Georgian Town House is conveniently located adjacent to Weymouth Beach and Waterfront and within easy reach of the town centre, Old Harbour and Pavilion Theatre. We aim to ensure you enjoy your B & B stay in Weymouth with us. 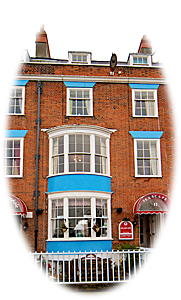 We are one of the few Weymouth Bed and Breakfast Guest House establishments to be able to offer you rooms with either views of Weymouth’s glorious sandy beach or the timeless charm of Weymouth Old Harbour. 2019 promises to be an exciting time in Weymouth with a huge number of events taking place offering something for everyone, why not plan your visit to coincide with your favourite. You can find out more on our local links page where we also have information on nearby restaurants and attractions. If you’re traveling by car we have a limited number of car park permits. When you make your booking we will confirm whether we have a permit available and if we do reserve it for you. Details of where you’ll be able to park can be found on our about us page. We have free WiFi available for our guests in our lounge, dining room and all bedrooms. We hope you find all you need to know about us on our website. Please feel free to contact us with any queries you may have or to make a booking. Read reviews of Seascape Guest House in Weymouth.